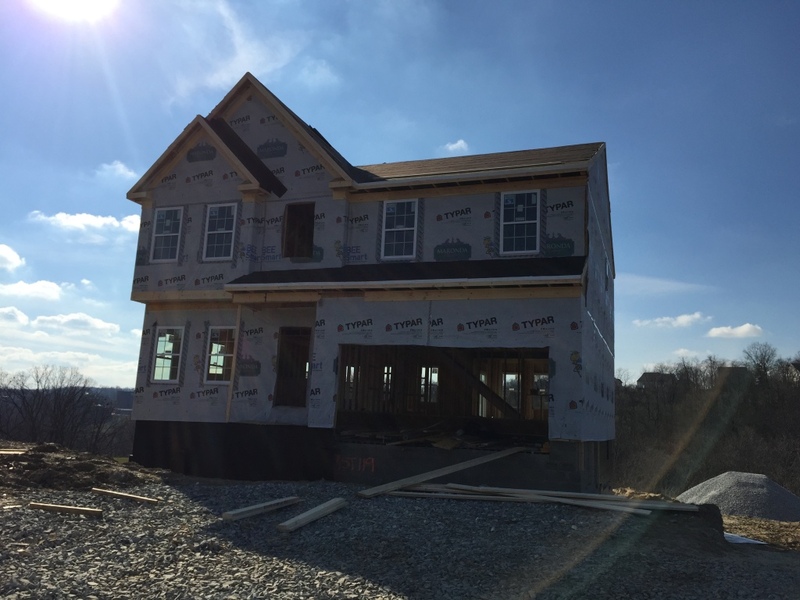 Our house is new construction, and we were warned by the sales guy for the builder about interim taxes. We were also expecting to get billed for the interim taxes *after* we got the money back from our escrow analysis for this year (expected April/May). It didn’t quite go down like that. Mortgage companies don’t pay for interim taxes. 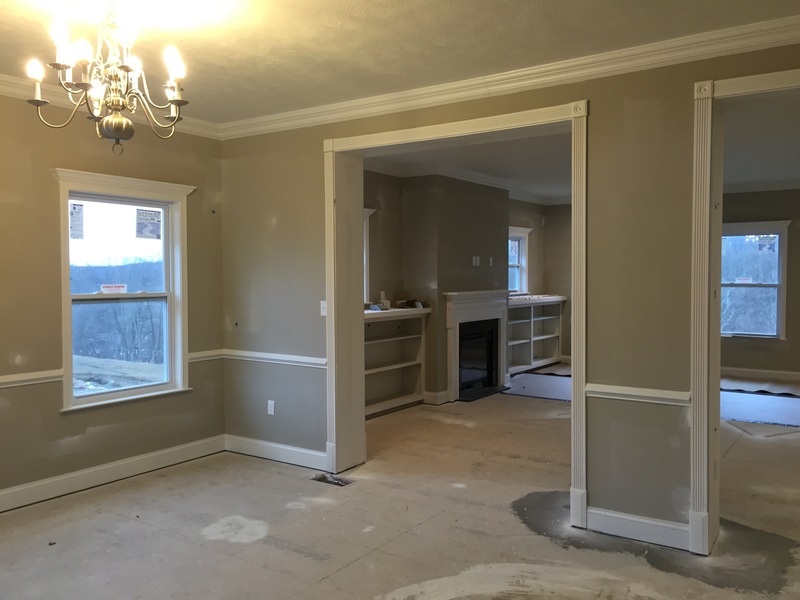 Since we have new construction, and the property hadn’t been assessed at the time the tax bills went out, we paid taxes on the unimproved land amount (about $200). But, we own improved land with a house on it, and the county comes by to re-assess the property once the deeds are filed and they get off their asses to do so. We had gotten the 2016 assessment back in September, and know what we’ll be expected to pay (more or less) next year. On Thursday, I got a letter letting me know that the county assessed our house in 2015 for interim tax purposes (at more than our 2016 estimate?). On Friday, I got three bills from the local tax collector: one for 2014 school taxes (2 months worth since they’re on a fiscal year of July-June), one for 2015 school taxes, and one for 2015 borough taxes, totaling about $8.5k. Not having that money easily accessible and deciding to borrow from our line of credit (again) to cover us until we got the expected escrow analysis in April, I moved money into our checking account and wrote the checks (yes, they had to be three separate checks). I had until January 19, 2016, but I figured I’d rather take the tax deduction this year rather than next. So, I put the checks together, put them in an envelope to mail off this morning (Monday). Monday mail arrives, with the escrow analysis and a check for $6.1k. Now, we only have to cover just over 2k in taxes, which we expect with Dad’s annual bonus in a few weeks. It’s not that I *like* coming up with 2k out of the blue, but we were kind of expecting this to occur, just not as quickly as it has. That $6.1k will be deposited tomorrow once we both sign it, and then it will be transferred back to the line of credit so we’re not borrowing quite as much. There’s still quite a large escrow balance with our mortgage company, and we’re probably going to “owe” them next year for escrow (about $300-$400), but it was nice getting that check now instead of in April/May when it would have been a year since we got our mortgage. I wonder if the analysis will continue to occur in November or the very large balance in the escrow account triggered the analysis, or if it’ll begin occurring April/May like I was expecting. This entry was posted in Finances, Home on November 23, 2015 by Mom. 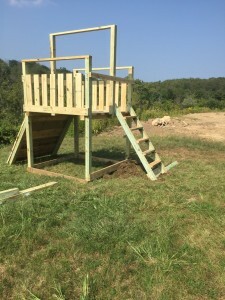 I’m now more confident in our ability to add a deck next summer/fall – Dad, not so much. 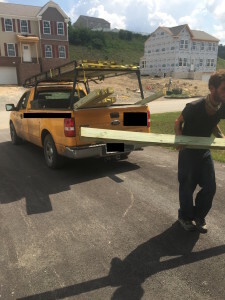 There were some differences between the instructions and reality, and we did OK in resolving them – one involved another trip to Home Depot for another piece of lumber to re-drill (luckily, not a 12′ beam!). There were only two trips to the hardware store after assembly started – to acquire an impact wrench (best invention ever!) and the second beam of wood. There were multiple trips while I was prepping the wood however. I needed a longer drill bit (did you know a standard drill bit won’t fit through a 6″ beam of wood? – they sell extra long bits for this purpose), the right size socket for the impact wrench (there are special impact sockets), and I picked up an impact driver as well. I have to say, I really like the impact driver and wrench. 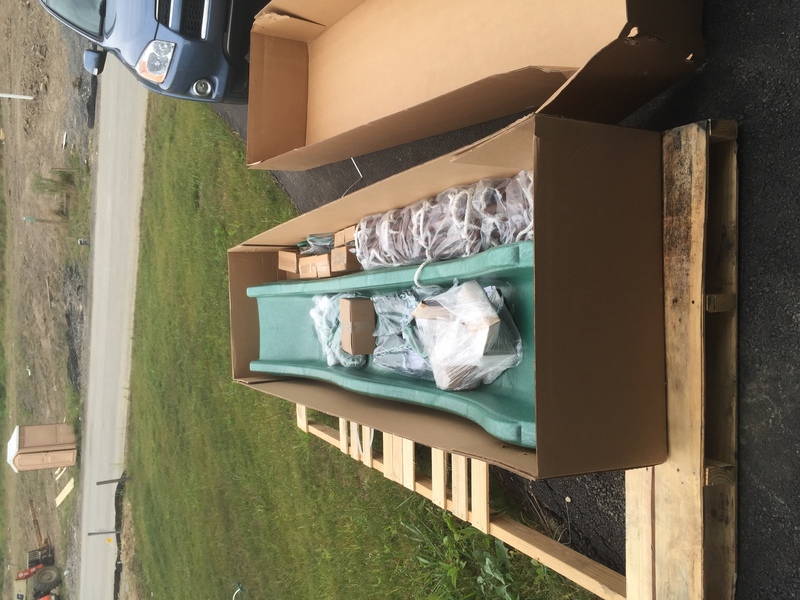 Between the two, we were able to drive in 3 1/2″ lag screws pretty easily and attach the decking and rock wall very quickly. My little brother said he was going to come over at 8am on Saturday, and he’s notoriously unreliable, so we planned for him to show up around 9 – he actually showed up around 10:30. So, we didn’t even really get started until 10:30-10:45 on Saturday. And lucky for us, it was one of the hottest weekends of the summer (yuck!). We started following the instructions, and set up the fort frame. Then quickly discovered that our “level” backyard isn’t so level. We had to dig out 4″ at the “front” of the fort to have it level. That took what seemed like forever. And the portion of the yard we put it in gets zero shade throughout the day – not morning shade, not afternoon or evening shade (And I forgot to put on sunscreen – ouch!). As you can see, the fort is a good size (6’x6′). 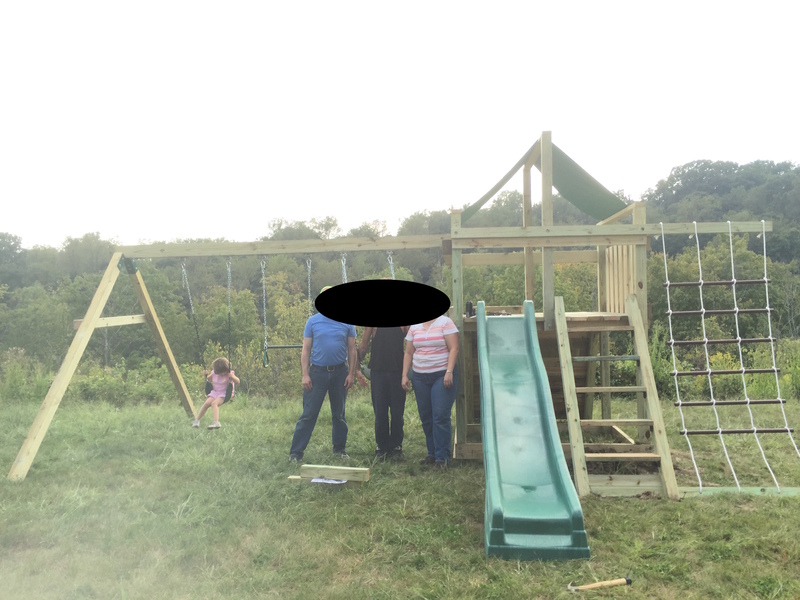 We had to measure carefully, because there will eventually be a 10′ monkey bars hanging off the right side there. 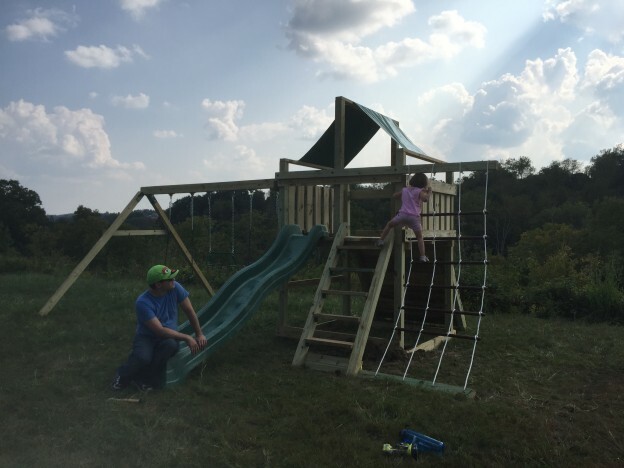 By lunch, we had gotten the basic frame of the fort done, and we ran into our first issue with the instructions. 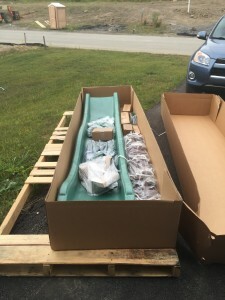 The side that holds the swingset needs a swingbeam (4x6x70″) instead of a simple panel. There were no holes drilled on the posts to put the carriage bolts through. So, I had to go get the drill, find the extra long extension cord and drill new holes – which weren’t quite straight since I wasn’t using the worktables in the garage. But, they worked, and we got the beam on. Then we went to put on the metal support for the swingbeam, and the holes weren’t drilled evenly (or even close to the holes in the support). My brother tried to fix it, but wasn’t super successful. He had to go to a party, so he and my mom left, and Dad and I continued and installed the rock wall. My mom and my brother were to come about 9am to resume helping. Again, my brother is not very reliable, so he and my mom showed up about 12:30 – after we had eaten lunch (and he was upset we didn’t save any pizza for him). While we were waiting, Dad and I were able to put together the ladder to get up into the fort, and attach the bottom beam for the rope ladder. We had a few kludges here too. One, we had to work with Daughter Person around us and getting into all kinds of stuff, and the ladder didn’t fit into the opening 🙁 I hauled out the miter saw again and cut a few angles and solved that issue, then we had to contend with the un-level ground again, and dig in the bottom of the ladder and rope ladder. I hate digging. 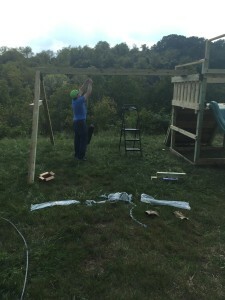 At this point, my brother showed up and we decided to just go get a new beam for the swing support and re-drill the holes. My brother and Dad installed the slide and the rope ladder by the time I got home from Home Depot with the wood. I went back into the garage to drill the holes right (measured off the metal support thing rather than the tape measure! ), and Dad went to rest his back and complain that he’s old. We *finally* get the swing beam support up and attached and then we have to tackle installing the swing beam. That was probably the hardest part of the entire operation – and tempers were flaring. 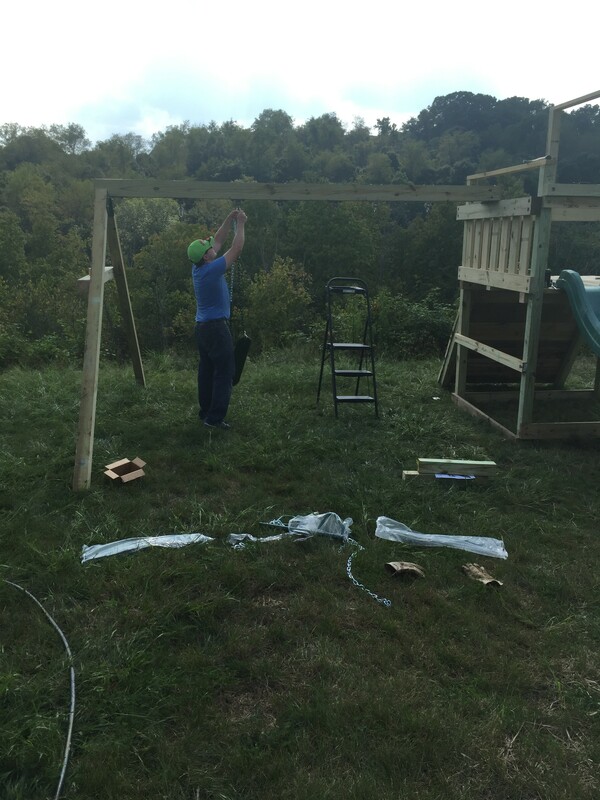 My brother almost broke the A-frame metal support by trying to connect the legs to the swing beam while it was vertical and then tipping it towards the fort. Turns out, following the instructions was the almost right move in this case: support the swing beam on the fort while attaching the legs, then walking the legs away from the fort. 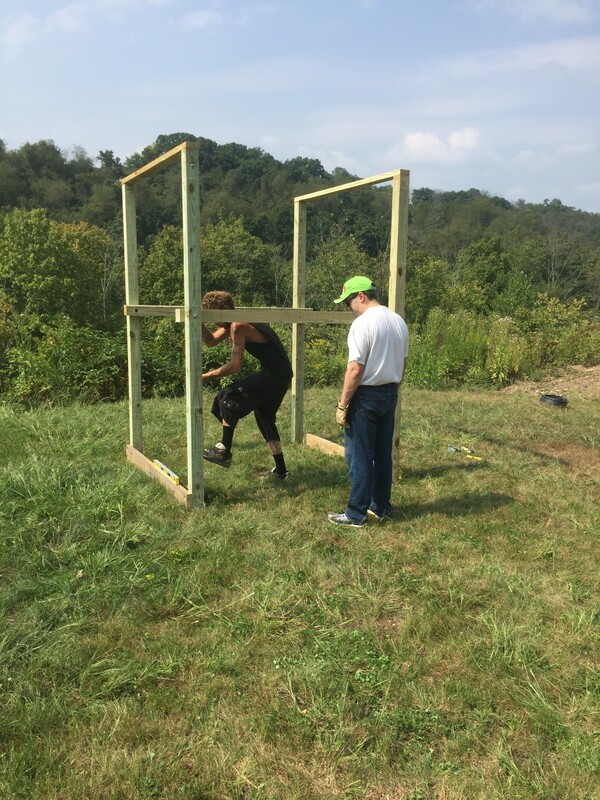 Then, you get to level the swing beam by pulling apart the legs (thus bending the A-frame support – just in a different way). It’s done, we’re proud of it, and still talking to each other. Although, both of us are a little singed and very sore from using muscles that we don’t normally use. And, I don’t want to go outside until the temperature drops well below 90! This entry was posted in Home on September 8, 2015 by Mom. If there’s one thing I hate more than packing, it’s unpacking. Almost three weeks into the new house, and we’re slowing down on the unpacking. Mostly because the house is functional “enough”, but there are boxes everywhere still and it’s starting to drive me nuts having them around. All of the kitchen stuff is unpacked and put in the kitchen, but I just shoved stuff in the pantry, so it needs a bit of organizing. I gave in and ordered two Elfa door “systems” for the spices. 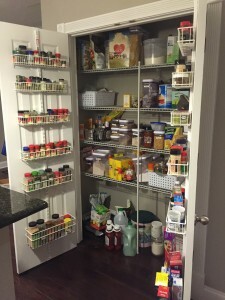 The pantry was too deep and the spices kept getting lost – and I really missed my spice racks from our old house. There are more pressing things than the pantry, everything fits, and we can (mostly) find things when we need them. We still have a lot of stuff just hanging out on kitchen counters though because it doesn’t have a new home yet. We added honeycomb blinds to the house. 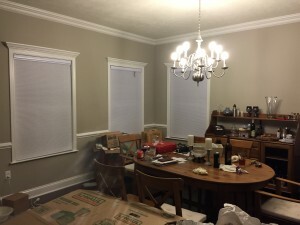 I *highly* recommend blinds.com – awesome customer service. I got one blind with a frayed string, called them up the next day and they shipped me a new one, no need to return the old one. They’re also quite easy to install at least with their “interior mount” option – four pilot holes with the drill, screw in four screws into the window frame, and then the blinds just pop into the mounting brackets. Also, relatively inexpensive for the honeycomb cordless that you can also pull down from the top: ~$85 for a 36×60 window. The only room that I feel is really done is our master bath. Since my office is off the master bedroom and it’s not close to being done (I’ve opened exactly 1 box in it), the master is still questionable as well. We’ve put aside 4 boxes to be donated/sold and continually add to it. I have one box set aside for Daughter Person’s toys that she has grown out of, and our friends with a 1 year old get first rights of refusal on that box. This weekend, We’re borrowing my uncle’s truck to go pick up our storm door, some more metal shelving from Costco, another trip to IKEA for a bookcase and a grandfather clock from our friends. We’ll also be loading our old freezer on it to go to my uncle’s. We bought a larger one, and they’re taking the older one off our hands – it’s currently in the garage (another “room” we’ve barely touched in the unpacking…). If I can get my car in the garage by winter, I’ll be a happy person. This entry was posted in Home on May 22, 2015 by Mom. We are now officially home owners again! Closing was this morning and everything went well. We even had to bring 1k less to closing than the GFE since they adjusted our initial escrow amount. I’m still keeping some set aside until we know how interim taxes will affect us and what the property is appraised at for tax purposes. Tomorrow the deliveries start, and the movers indicated that they would likely be delivering our things out of storage on Monday (we won’t know for sure until Sunday). We also have a mortgage again, so our updates will reflect that as well. Now, I can get started on our free trip to Disney. Brad recommends 18 months, we’ll be trying ~8 months (next January) – we have a relatively high rate of spending, especially with new things to buy for the house, so we should be good. I just need to get on applying for those cards now that we’ve closed (finally!). This entry was posted in Home on April 30, 2015 by Mom. We now have a closing date set for April 30! They’d have had to get special permission to do the 1st, so we said OK to the 30th. We’ll do our final walkthrough on the 24th to give them the list of “little things” to fix prior to closing. I’ve placed a call out to the moving company to hopefully get them up here on the 1st to move in (or even afternoon of the 30th since closing is at 9am). I’m still waiting for them to call me back. We’re ready to do this! The kitchen from the living room. All of the hardwood is sitting on the left waiting to be installed. 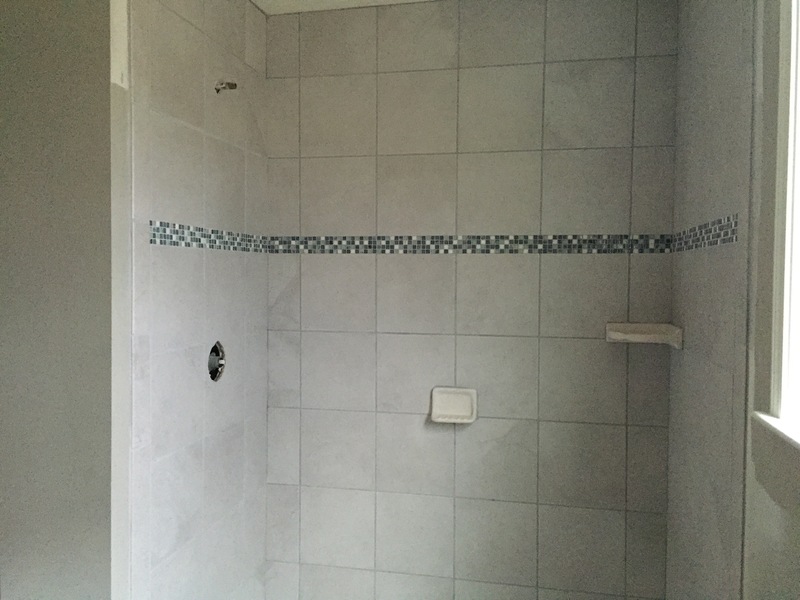 The tile in the master bath/shower is done. 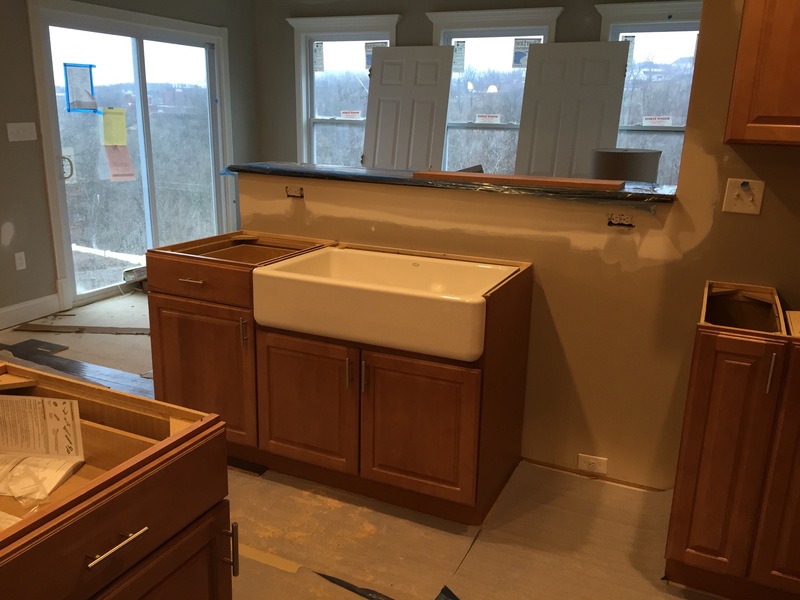 This is our “main” kitchen sink and looking into our sunroom, which will be Daughter Person’s playroom (tentatively). 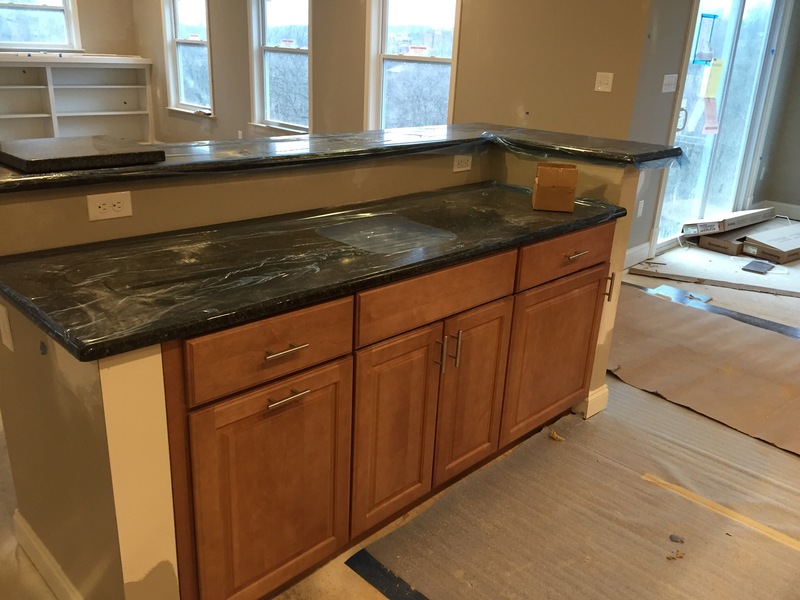 Some of the granite is already installed. There’s some hardwood under that butcher paper. This entry was posted in Home on April 9, 2015 by Mom. Theoretically, we should have been bale to move into the new house sometime in April – I’m thinking it may be May at this point. We still don’t have an electric meter, and no clue on when that will be installed. It has to be installed by the electric company, and my guess is that they’ve been busy doing other things this winter – like keeping the power on for everyone else. 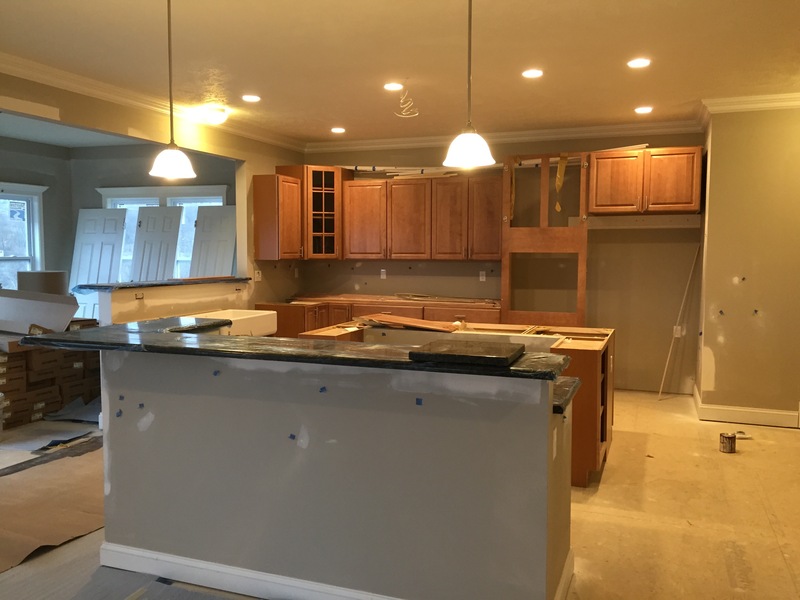 Once the electric meter is installed, we’re looking at at least 3-4 weeks before the house is finished, then 2-3 weeks after that to close and move in. I’m going to put my money on sometime in May. The worst part is that the builder has no clue when the install will happen, so therefore, we have no clue. 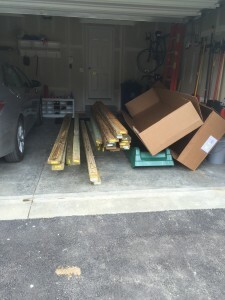 We’re all ready to move out of my mom’s house – desperately! We can of course, walk away at any time and just be out our 8k escrow – and we’ve seriously considered it. 8k is a lot, but not that much in the big scheme of things, especially when we’d really like our own place. Unfortunately, we’d have to buy a place and remodel the kitchen (at least), and that would take 1.5-2 months anyway, so we’re not really any better off if we go that route. There’s no recourse available to us yet other than losing our 8k. *But*, the builder can opt to raise the price 30 days after the estimated completion date, and we can simply choose to walk away at that point (with our 8k). But that’s only if the builder decides to try to raise the price on us. The next opportunity to walk away without losing the money is in early September – one year after the original contract. For now, we’re just going to sit tight and wait. We’ve put a lot of things “on hold” until we can move – like saving for a trip to Disney next fall using CC points, because we can’t be applying for new cards when we’re waiting to get our mortgage approved. Dad is considering changing jobs, but we really can’t until the mortgage goes through. We spend a lot of time in the car driving to and from activities for Daughter Person, because we signed her up closer to the new house rather than my mom’s. We’re also not as aggressively paying down our car loan until we get the final damage from closing costs. Right now, our life is full of “when we (finally move)” wishes. This entry was posted in Home on March 20, 2015 by Mom. I made a few goals for 2014, almost none of which worked out. Oh well, I wasn’t expecting to pick up and move either! I gained 20lbs instead of losing 15: FAIL. Technically failure, but only because we sold our house and lost that asset, although it may have been close if we hadn’t sold the house. The good thing is that we’ve made a serious commitment to saving more for our early retirement this year. I’ve increased my salary, we’ve upped our contributions to max out our 403(b)s in 2015, as well as contributing to an HSA and hopefully two Roths next year. Our retirement accounts have increased significantly (from $337,687.88 in January to $423,630.36 at the beginning of December), even if our Net Worth didn’t. Early next year, I’ll be posting my goals to fail at for 2015. Have a happy and safe New Year! 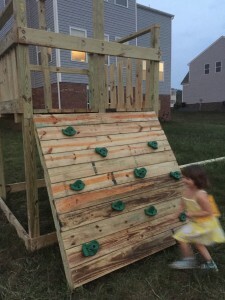 This entry was posted in Finances, Home and tagged goals on December 30, 2014 by Mom. And I don’t mean the credit card kind. I mean the apps that are available like ibotta, checkout51 and Walmart’s new Savings Catcher. I don’t earn a lot, but in the last few months, I’ve earned about $20 between the three of them. Sometimes, I earn a “cash back” on one item multiple times through the different apps – it depends on what it is. Ibotta especially focuses on name brand items, but occasionally has “generic” items available, like milk, bread and eggs. Checkout51 pretty reliably has bananas every week, as well as the occasional milk and bread. Ibotta is store specific, ALDI’s isn’t an option there, but Costco (and the local liquor store) is. Checkout51 doesn’t care where the receipt is from as long as it’s pretty obvious that you bought the item in question. The WalMart Savings Catcher is a relatively recent addition to my phone – it “scans” through published ads and matches them to items on your receipt – so you don’t have to remember your ads or remember to ask them to match. From what I can tell, it doesn’t cover WalMart’s entire ad matching policy (doesn’t allow non-branded items like produce and meat), but it gets the rest. Other than Costco, WalMart is my primary grocery store, so it was worth looking at (and I can still get ibotta/checkout51 rebates on the same receipt). I’m not hugely brand loyal, so I don’t get a lot of money from these things, but if you are brand loyal or even brand agnostic, you might be able to “make” more than I do. I don’t even bother to look at the apps until after I’ve already purchased my groceries, so I don’t tailor my shopping to meet their lists. I get the brand I want or the cheapest option – the 25-50 cents that I get from the apps doesn’t make up for the price differences usually. Disclaimer: I just use these apps, I have no affiliation with them in anyway. I also know that they are recording what some people refer to as sensitive information, and folks aren’t OK with that. As I see it, the stores can already trace my purchases back to me via my credit card, so it’s not a privacy issue for me. Does anyone else use the cash back shopping apps? Or am I the only one willing to take pictures of my receipt and scan barcodes for some cash back? Any other apps I should look at? This entry was posted in Home on December 12, 2014 by Mom. We obviously have an extremely fast framing crew – apparently, we were assigned the Amish framing crew (which means quickly and high quality). This picture was almost exactly one week after the previous picture with just the foundation. I know the majority of the walls were delivered already put together, but I think this was *fast*. They’re still telling us that we can move in at the end of March – based on what I’ve seen, we might be moving earlier, but I don’t know anything about building houses. My guess is that they’re working extremely quickly to get the houses under roof and with the siding on before the weather turns too bad, then progress will slow down a bit. The day before and the day after this picture was taken, there was a dusting of snow on the ground (not for long). There’s already one mistake on the house (a missing window on the right side), and I’ve reported it to the sales guy and production manager – in writing. They knew about it, and they expect it’ll be fixed in the next two weeks – as soon as the window arrives. That’ll be interesting to see how they just cut a hole in the framing and put a window in. I wonder if they’ll try to put the siding on that side last. There are a few other places I’d like to see windows (like the two front upstairs bedrooms), but they weren’t options, so those’ll have to wait until it really bothers me to do something about. This entry was posted in Home on November 18, 2014 by Mom.